In September 1754, Colonel and Brigadier General Sir Edward Braddock was appointed by King George II major-general in command of all the British forces in America He was directed to sail with two regiments of Regulars, to drive the French from the Ohio Country. The Provincials or colonial militia appeared to be worthless. British Regulars would soon do the business. Sir Edward had been born into the British army. His father had been lieutenant-colonel of the famous Coldstream Guards, one of the crack regiments of old England. He himself had been an ensign of the Guards at fifteen, at twenty-one a lieutenant, at forty a captain, at forty-seven lieutenant-colonel; next, colonel of the Forty-fourth Foot and brigadier general of the line. Through all these years he had fought upon many fields. Now in 1754 he was a burly, broad-shouldered, six-foot veteran of sixty years, with a reputation as a drill-master, a swordsman, and a hard-bitted soldier. He was short-tempered and obstinate, and brave. Everybody in the army knew "Charley" Braddock. If anyone could make quick work of the French, he was the man; and he would speedily discipline the provincial militia, also. His own regiment, the Forty-fourth, was the best drilled regiment in England. In the late winter he set sail with his staff of officers and a company or two as guard. The two regiments chosen were the Forty-fourth, commanded by Colonel Sir Peter Halket the Scotchman, and the Forty-eighth, commanded by Colonel Thomas Dunbar. It was February 20 when General Braddock arrived in Hampton Roads of Chesapeake Bay; he made his headquarters at Alexandria, up the Potomac and only a few miles from Mt. Vernon, the home of Colonel Washington. Here at Alexandria the troops were landed at last, in March. They were a fine sight, those gold-laced British officers in the king's scarlet, and those stiff, red-coated, peak-hatted British grenadiers. Washington longed to join the expedition, in order to learn Regular army methods and to help clean out the French intruders; but the officers of the British Regulars ranked the officers of the provinces, and he feared that he would not be given the chance to show what he could do. General Braddock heard good word of this young "provincial" colonel; he directed his aide, Captain Robert Orme, to invite Colonel Washington to join as a member of the staff with rank of captain in the British army. The letter of invitation, marked "On his Majesty's service with speed," was welcomed. George Washington gladly accepted. He and the other young aides-de-camp, Captains Orme and Morris, and the general's military secretary, Captain Shirley, became great friends. General Braddock was a long time in getting started. He had to wait for supplies and recruits and militia. Meanwhile he fumed and fretted. The French were hurrying troops across the ocean to America, Fort Duquesne was likely to be reinforced. But he never lost confidence. He moved headquarters to Frederick, farther inland, in Maryland. Here he met the great and benign Benjamin Franklin. "I shall take Fort Duquesne by the first of June," he said, to Benjamin Franklin. "Duquesne can hardly detain me more than three or four days; and then I can see nothing that can obstruct my march to Niagara." "It will require a very long line, perhaps four miles, to march by a narrow road through the forest and over the mountains," Franklin the wise thought to himself. So he ventured to say: "To be sure, if you arrive safely before Duquesne with these fine troops and your artillery, it can probably make only a short resistance. But the Indians are very skillful in laying ambuscades; and the slender line that your march must form may expose it to attack that will cut it into pieces like a thread." "These savages may indeed be a formidable enemy to your raw American militia," he declared proudly; "but upon the king's regular and disciplined troops, sir, it is impossible that they should make an impression." "In my opinion, sirs, our principal task will be to march up the hills and come down again." The actual start was to be made from the Ohio Company's supply post of Fort Cumberland, at the mouth of Will's Creek up the Potomac River. From here stretched the Indian trail to the Monongahela River—the trail that Christopher Gist and Washington had followed when they went in, across the Allegheny Mountains. On the road to Fort Cumberland (and a very bad road it was, too, through the wilderness) General Braddock passed his troops. He had bought a red state carriage from Governor Sharpe of Maryland; and now he posted at full speed, well jounced, and flanked by his galloping aides-de-camp and a light-horse guard. The drums and fifes received him with the Grenadier's March; seventeen cannon saluted him at Cumberland. But by this time he had had enough of such travel. He changed his mind about going on to Duquesne in a crimson coach. Horse and saddle were better suited to this kind of a country. The troops had been twenty-seven days in marching some one hundred miles through timber and brush and over the Blue Ridge Mountains. They were footsore and weary. Evidently a tough campaign lay before; to get wagons and artillery farther looked to be a task indeed. Ensign Allen of the regulars, appointed to drill the militia, had his hands full. General Braddock decided that the Americans never would amount to much as soldiers; and he made no bones about saying so. On the contrary, Captain Washington and others rather believed that when it came to fighting Indians in the forest the "raw" Americans would give a good account of themselves. Drilling in massed formations, every man as stiff as a poker, was a poor way to prepare for woods fighting. Still, there had to be discipline. When by June 7 General Braddock was ready to march, he had all told about twenty-two hundred men. There were the two regiments of British grenadiers, each recruited up to seven hundred; there was a company of Virginia light horse, commanded by Captain Stewart; there were two half companies of New York volunteers; there were some thirty British sailors, to help with the tackle for dragging the cannon; there were two companies of sixty pioneers or road makers; there were Scouts George Croghan and Christopher Gist; there were only eight Indians, under Chief Scarouady, who was now half-king, since old Tanacharison 's death last fall; and there were many women, for laundresses and so forth. Scout Captain Croghan had received word that on the march the celebrated Captain Jack and his band of forest rangers would join. This Captain Patrick Jack of the Pennsylvania border was known as "Black Hunter," "Black Rifle," and the "Wild Hunter of the Juniata." He had lost his whole family, by the Indians. Now he and his band did nothing but hunt for scalps. His very name spread far from the Lakes to the Ohio. The Braddock army contained a number of men famous in American history. George Washington, aged twenty-seven, was an aide-de-camp. Horatio Gates, who as American general in the Revolution accepted the surrender of General Burgoyne at Saratoga in 1777, was captain (ranking as major) of one of the New York companies. Daniel Morgan, the gallant leader of the American riflemen in the Revolution, was a wagonner. Among the other Virginians there were several who would fight the Chief Cornstalk warriors at the great battle of Point Pleasant, in 1774. As lieutenant-colonel of the Forty-fourth Foot there was Thomas Gage, who became Colonial governor of Massachuetts and commander-in-chief of the British forces in North America; and who while stationed in Boston in 1775 ordered the assault on Bunker Hill. His colonel, ranking next to General Braddock himself, was Sir Peter Halket, a doughty old Scotchman, brave through and through, and with good sense enough to fight in the Indian way, were he only permitted to. From Fort Cumberland it was about one hundred and twenty-five miles by trail to the Forks of the Ohio and Fort Duquesne. A road had to be opened, every inch of the way; trees had to be cut, streams bridged, bogs filled, for the wagons and the artillery. If Captain Washington, Captain Croghan and Christopher Gist might have managed matters, they would have left the baggage wagons and gone in with only pack horses. "Blankets, an ax, a rifle and ammunition are enough for the men," Captain Croghan the scout and trader asserted. "Why, here are hundreds of wagons, and gimcracks and nonsense to fit out a town, and all the officers of foot on horseback! I should like to give those fellows a woods drill," he added, "and upset half their rum kegs." But General Braddock could not understand. "We," Captain Washington sighed, "shall have more to do, I foresee, than to march up the hills and come down." They were ten days in crossing the mountains and arriving at Little Meadows, only twenty-five miles. And here the soldiers were again so worn out that a week's camp was necessary. Those British Regulars, in their tall pointed leather hats, their tight red coats, their leather leggins, their cross belts and knapsacks, carrying their ammunition boxes, their mess kits, their heavy muskets, never had dreamed of such marches. How dense the forests were! How immense the trees, how silent the vast reaches of country, how steep the hills, how dark the nights, and the shadows brooding in the timbered aisles! And the names—the Great Savage Mountain, the vale of the Shades of Death! Never an Indian joined the column, never a soul greeted it as it struggled on and on in a line sometimes three miles long, with files of sweating red-coats tugging at the wheels. On the western side George Croghan brought the noted Captain Jack the Black Rifle to General Braddock's tent. Black Rifle had turned up, as promised, with fifty border scouts—Indian slayers, every one. He was six feet three inches tall, as thin as a bean pole, as swarthy as an Indian, and never smiled. "I require no more undrilled men. I have experienced troops on whom I can completely rely." Whereupon, with scarcely a word, the indignant Black Rifle led his men away: clad in their buckskins and moccasins, bearing their long flintlocks at a trail, they vanished, one after the other, into the forest, and were not seen again by the Braddock army. By this time General Braddock had been convinced of the roughness of the country. At the rate he was traveling he would be weeks in getting to Fort Duquesne, and would be too late to head off the reinforcements. So now he sought Washington's advice. He decided to lighten his column. He chose a detachment of a thousand of the best grenadiers from the two regular regiments, added for good measure the Virginian riflemen, and Captain Gates' company of New Yorkers; and with twelve hundred men, pack-horses, thirty ammunition wagons, eight cannon and twelve hand-mortars he pushed on. This was June 19. He left Colonel Dunbar of the Forty-eighth to bring the remainder of the men and the heavy baggage. Colonel Dunbar did not like that duty. "The English general and his soldiers are fools. We will shoot them all like one pigeon, when the time comes." But Captain Contrecoeur feared. His spies reported that the English army numbered at least four thousand. He himself had in the fort only a small company of French regulars, and about one hundred and fifty Canadian militia. Their officers were the young Chevalier de Beaujeu, Lieutenants Dumas, de Ligneris, and Captain Charles de Langlade, a famed half-breed ranger. Outside the walls six hundred Indian allies were encamped. They were mainly Ottawas, Ojibwas and Chippewas, from the Lakes, but they included Shawnees, Hurons, Delawares and others of the Ohio Valley, who had taken up sides with the French. 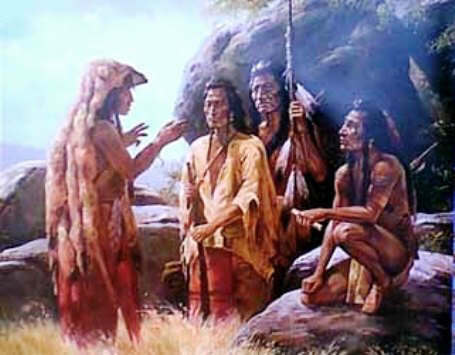 Their chiefs were Pontiac of the Ottawas, old Shingis of the Delawares, the Ottawa Nissowaquet whose sister had married Ranger de Langlade, Athanasa the Huron, Beaver; among the fiercest of the warriors was the young Shawnee brave, Catahecassa or Black Hoof, who as a chief in 1779 took part in the great Indian attack upon Daniel Boone's fort of Boonesborough. When Captain Contrecoeur learned that a British major-general was bringing four thousand men, and much artillery, and was leveling the forest as he approached, he planned to surrender. Fort Duquesne, built of logs and dirt-roofed, was not proof against cannon-balls. Neither were his Indians. They likely would run in fright from the terrific noise. "I ask permission to go to meet the English and surprise them on their way, while they are crossing the Monongahela." "That would be a madman's act, my son," Captain Contrecoeur objected wisely. "We are too few. We cannot depend upon the Indians. Had our reinforcements arrived—But now—" and he shrugged his shoulders—"we must accept the fortunes of war." Lieutenant de Beaujeu pleaded eagerly. "I pray you let me strike a blow for France. By surprising their advance we may throw them into confusion; but if we let our Indians disperse without scalps, our cause will be lost in the Ohio Country." "You may go, then, in the name of France," Captain Contrecoeur yielded. "That is, if you can get volunteers. I shall issue no orders. The deed shall be yours." Lieutenant de Beaujeu (he was scarcely more than a boy) joyfully hastened out. The French and the Canadians volunteered, every man. With the Indians it was different. "We are in all only eight hundred men, and you ask us to attack four thousand, with cannon and horses? You have no sense." De Beaujeu spoke again, urging; Charles de Langlade the white Indian spoke, in the Ottawa tongue, with words of fire and scorn. "We will sleep upon your plan and talk further in the morning," the chiefs answered. Early in the morning they refused to go. Lieutenant de Beaujeu sprang to the gateway of the fort. "Then I shall go out, myself, against the enemy!" he cried. "Will you suffer your father to go alone to victory?" "No, no!" they cheered. "Lead us. We are not women. Lead us to strike the enemy." So barrels of gun-powder and casks of flints and bullets were opened outside the gates; the Indians thronged to help themselves; at the head of seventy French Regulars, one hundred and fifty Canadians and six hundred and forty of Pontiac's warriors, the slender Lieutenant de Beaujeu sallied into the forest. General Braddock had been coming indeed, with the advance column, at the rate of two to four miles a day—"moving along as solemn as a box-turtle," Christopher Gist said; "for any smart turtle ought to travel two miles in a day." "We must needs stop to bridge every brook and level every mole-hill," Captain Washington criticized. Better speed seemed impossible. The pioneers of Lieutenant-Colonel Sir John St. Clair, felling trees and grading hills and bridging streams were constantly blocking the way. The grenadiers were lame of foot, and pestered by ticks and mosquitoes; during the day they sweat in their thick woolen uniforms; during the night they shivered with the dampness. There were alarms; Indian spies lurked close, killed the stragglers, stole the loose horses, until in every moving shadow the eye saw an enemy, and every rustle in the brush was an attack. June 24, after a week's march General Braddock was only at Great Meadows, twenty-five miles from Little Meadows and seventy from Fort Duquesne. He himself was in good spirits and was determined, but Captain Washington had been taken ill and placed in a wagon at the rear. The general had promised him, though, that there should be no battle without him. Recent Indian camps were passed; the Indians and the French had left boastful threats printed upon smoothed tree trunks. The soldiers were ordered not to fire their guns to clean them of damp powder, but to draw the loads frequently and put in fresh ones. July 4 the column was at Thicketty Run, about thirty miles from Duquesne, and was short of supplies. On July 8, when Lieutenant de Beaujeu was pleading with his captain and with Pontiac's Indians, it was nearing the Monongahela River, and this evening encamped two miles from the banks, or fifteen miles from Fort Duquesne. The supplies from Colonel Dunbar's train, forty miles behind, finally caught up; and with them, Captain Washington, pale and weak but bound to be present for the attack on Fort Duquesne. "I would not miss it for five hundred pounds," he had written to his brother Augustine. Scarouady had been captured and had been found tied to a tree, but unharmed. Christopher Gist, scouting in the advance, had had a narrow squeak. And now some panicky grenadiers fired upon their own Indians and killed Chief Scarouady's son. General Braddock ordered a military funeral, with volleys over the grave. This healed the chief's heart. Beyond the camp the Monongahela formed a bend. General Braddock planned to cross by a ford to the western bank, then by a march of five miles northward recross to the eastern side—the same side as Fort Duquesne, which was located in the angle where the Monongahela from the south and the Allegheny from the north joined to make the Ohio. The land between the two fords was a beautiful high plateau or stretch of bluffs, bordering the river, and easily climbed from the first ford. This should be the line of march. Orders were issued for "parade dress." General Braddock wished every man to appear in pipe-clay and stiffened queues and spick and span uniform with buttons polished. No doubt the French and Indians would watch the crossing and he desired to show them the sight of a real British army. Washington was of different mind. He announced that he should change his British uniform of scarlet for a plain-colored buckskin shirt, like those of the rangers; and he advised his fellow officers to do the same. They laughed at him; said that it was unworthy of a soldier, and would look like fear. But he did change, in the morning; and afterwards believed that this saved his life. He also ventured to advise General Braddock that the Virginians be sent to the fore, under himself, to clear the way from ambuscades. General Braddock angered. "High times!" he growled. "High times, when a young Buckskin can teach a British general how to fight!" The next morning the Virginians were put in the rear. General Braddock proposed to cross the two fords, encamp not far from the fort, and on the morning after demand its surrender. Until late this night the grenadiers were busy, by firelight, whitening their cross-belts with pipe-clay, soaping their queues or pig-tails, polishing their buttons and muskets and scouring their uniforms. Back in Philadelphia the citizens were collecting funds with which to celebrate the capture of Fort Duquesne. "I think that it would be better to raise the money after the victory is accomplished," Benjamin Franklin said. At three in the morning, July 9, 1755, the advance guard, three hundred regulars and Captain Horatio Gates' company of New Yorkers, under Lieutenant-Colonel Gates, marched out to secure the fords. At four o'clock the pioneers, two hundred and fifty ax-men, with two six-pounder cannon, followed. At six o'clock the drums and fifes sounded the "general," and the main detachment of regulars and Virginians commanded by Sir Peter Halket started. With the rest of the staff Captain Washington watched the crossing of the first ford. A brave sight it was—the finest sight, he afterwards declared, that he ever saw: the solid ranks of brightly red-coated white-belted British Regulars, stiffly erect under their tall peaked hats, with bayonets flashing and muskets gleaming, flags flying and the fifes and drums playing the "Grenadier's March," while all in step they splashed through the water and wound up the slope to the bluffs; his own blue-coated Virginians, afoot and ahorse both; the wagonners driving their teams, the creaking artillery, the camp-followers—everyone gay at the thought of victory. Well might General Braddock be proud. He had his faults, but he was a thorough soldier. When the second ford had been crossed without attack, officers and men might breathe easier. Evidently the French were not coming out. Fort Duquesne lay scarcely ten miles before, but could not be seen on account of a range of hills. Now it was past one o'clock, of a warm and sunny day. Sir Peter Halket marched his detachment into the first bottom, and halt was made by all for dinner. "Reform your column, sir," were General Braddock's orders. "Gage will hold the advance, and clear the way for the pioneers. You will proceed until three o'clock; then halt for camp." Lieutenant-Colonel Gage moved again, to clear the trail with two companies of regulars, and a smattering of light-horse videttes. Captain Henry Gordon, of the Royal Engineers, three Indian guides and six Virginia light-horse men took the fore, to survey the trail and mark it for the pioneers of Lieutenant-Colonel St. Clair. This trail proved to be a rough road about twelve feet wide, opened by the French wood-choppers. From the river-bottom where noon camp had been made it obliqued up a long terraced slope of forest and brush, for the top of a range of hills; from the top Fort Duquesne probably could be seen, among other bluffs to the west, where the Monongahela and the Allegheny Rivers joined. The three detachments—the Gage advance, the St. Clair ax-men, the main column with baggage train, of Sir Peter Halket—were separated by intervals of only a quarter of a mile. When the Gage party had crossed the second ford it had jumped about thirty Indians, who broke and ran without fighting. But that had been the only token of the enemy. Aside from these, nobody had been seen. The great forest seemed peaceful. The Sir Peter Halket column, leaving the bottom land, might hear the ringing of the axes as the pioneers worked, cleaning the wood road for the wagons and artillery. It was a comforting sound. Otherwise, silence reigned ahead. The most dangerous post of all was that assigned to Captain Gordon the engineer. He, and his six Virginia horsemen, and his three guides afoot, were in the front, and alone together, cautiously following the sun-flecked twelve-foot trail hedged by timber and under-growth. About two o'clock, before the top of the hills had been reached, and Fort Duquesne was still some eight miles distant, they had arrived at a second terrace, above the first. The main range of timbered hills awaited them directly before. On a sudden Captain Gordon witnessed an astounding spectacle. Down upon him, in the trail through the forest aisles, there came afoot, bounding like a deer, a slender white man clad in a richly fringed hunting shirt, with an officer's silver gorget or small metal plate, crescent shaped, dangling on his breast. Behind him there ran like a. pack of wolves a host of dark, painted Indians. "The French! Indians!" Captain Gordon shouted. But stopping short the slim young officer had waved his hat; without a sound the Indian pack darted right and left and instantly vanished into the fallen timber, the grape-vines and the brush and grass. The Gage advance was close upon the heels of the scouting party. A moment more, and a crashing volley belched from the very ground on either side—from the slope of a ridge on the right, and from ravines on the left. Three-fourths of the first company of grenadiers were mowed low like ripened grain. The videttes and flankers had not been thrown out far enough, in such a country. The ravines had not been noted. Now the forest had awakened. The slim figure wearing the silver gorget was the brave young Chevalier de Beaujeu, leading his French and Indians. He was too late to attack at the fords; his spies had found the English already there, and prepared. But this place suited. Hot with eagerness he was just in time. The ravines, choked with brush and ten and twelve feet deep, completely hedged the trail at point-blank rifle shot—sixty and seventy yards. And the ridge itself could not have been bettered as a vantage point. Colonel Gage formed his men in vain, and ordered them to charge with the bayonet. They delivered a smashing volley, but they saw nothing at which to charge. The Indian whoops pealed louder and louder, there were cheers of "Vive la France! Vive le roi!" Another volley, a volley of French musketry, lashed the trail. It came from in front. The road was blocked, surrounded. Dismayed and confused, the British regulars stood huddled, glaring through the smoke, and firing, and falling rapidly. The young officer with the silver gorget was rushing hither-thither, dimly seen as he encouraged his shrieking Indians and cheering soldiers. Driven back foot by foot, the Gage men, gamely fighting, were joined by the St. Clair detachment, hastening up. The six-pounders were wheeled and pointed; their grapeshot hissed into the thickets. Huzzah! The young officer had collapsed, stricken dead; the Indians were bolting from their coverts. Another round, lads; then charge with the bayonet! But a second leader had sprung to the fore. He was Lieutenant Dumas. He rallied the Indians, the firing from the thickets grew hotter; a perfect storm of lead swept the narrow road, the regulars knew not which way to turn. Colonel Gage ordered a charge on the ridge to the right, from which the firing seemed more severe. Scarcely an enemy was to be sighted; not a platoon would obey the command. Captain Gordon was unhorsed and wounded; Gage was wounded; the officers were being picked off; platoons found themselves without leaders; some of the platoons did run forward, a little distance, but when their officers fell the men ran back again. The column of General Braddock easily heard the uproar. Washington says that he himself could see the powder puffs and the soldiers tumbling. He knew that it was no skirmish, but an attack in force. General Braddock sent his aide, Captain Robert Orme, forward at a gallop, to learn the worst. He returned wounded in the arm, and reported a desperate struggle. The general ordered Lieutenant-Colonel Burton to take two-thirds of the column and support the advance; he and his staff accompanied. Sir Peter Halket remained to guard the baggage train. When the support was part way, it met a stream of ax-men and carpenters pouring down from the flat; all the timber above was blue with powder smoke, amidst which Sir John St. Clair was stoutly holding fast but hard beset. Now another aide spurred back to order up Sir Peter Halket and baggage guard. Arrived on the battle field, General Braddock took command. He, too, directed that the ridge be cleared with the bayonet—the bayonet was the British soldier's weapon. He did not know—nobody among the British or Americans knew—that there were several ravines, all opening diagonally upon the road and sweeping its length. A charge to right or left was useless, but a retreat to the river-bottom would have saved the army. General Braddock, British officer, was not a man to retreat. The traditions of the British army forbade it. And let it be said that no braver man ever wore a uniform. He raged here and there, like a lion, shouting his orders; he had faced bullets before. He ordered the regimental colors to be planted as rallying points. The company officers were told to separate their men into small platoons, and clear the brush with the bayonet. But as fast as the officers sprang to the front, and waved the men on, they fell. The men themselves were utterly dismayed. They cried out piteously. "We will fight if we can see anything to shoot at! Where is the enemy?" So they stood, huddled, shooting at random—even into the tree tops. In ran the Virginian rangers. They understood Indian fighting, and took to the shelter of the tree trunks. The regulars tried to imitate. General Braddock was after them immediately, calling them cowards, and striking them and the rangers with the flat of his sword. "Out with you! Out!" he raged. "I'll cut down the first soldier, British or American, who dares to skulk behind a cover!" Washington attempted to reason with him; but no use. A detachment of Virginians, stealing from tree to tree and about to rush a ravine, were killed by a volley from the grenadiers. The attack had extended on both sides of the road. Sir Peter Halket's reserve was engaged. Presently all was lost. The cannon had been abandoned, for the gunners could not serve the pieces. Washington was the only aide, and the only mounted officer left. Four balls had passed through his coat, two horses had been shot from under him. But he seemed to bear a charmed life. The Indians believed this; years afterward an old chief sought him out to tell him. "On that day I took seventeen fair shots at you, and I ordered my young men to fire upon you. But we saw that the Great Spirit was preserving you, and so we ceased trying." Washington rather believed that his dull-colored buckskin shirt had made a poor mark in the smoke. General Braddock was upon his sixth horse. In vain he tried to stay the rout, with commands and with the flat of his sword. The men were crazed by fear. They threw away everything, even their muskets. Captain Orme and Captain Morris were wounded; Captain Shirley, the general's secretary, had been shot dead at his side. Sir Peter Halket had fallen at the head of his regiment; his son, leaping to catch him, had crumpled across his body. The soldiers were running down the road, "as sheep pursued by dogs." General Braddock at last turned to follow; he could do no more. Then a bullet through his right arm and into his lung toppled him from his saddle. His men ran on, but Washington, the wounded Captain Orme, Captain Stewart of the Virginia Horse, and other officers rallied to him. So did his black body-servant, Bishop. They implored the fleeing soldiers to stop and lend a hand. No use. Finally they got hold of a tumbril or two-wheeled cart. They lifted their general into it. Some camp-followers agreed, for a guinea and a bottle of rum each, to drag the cart down the trail, strewn with knapsacks, blankets, muskets, cartridge boxes, uniform coats, hats, what-not. "No, no! Leave me. Let me die where I fell," General Braddock begged; but of course that was not to be thought of. The flight already stretched clear across the river. The wagonners at the baggage train had cut their horses loose and were tearing for the Dunbar division, miles behind. General Braddock continued to issue orders. In the river bend between the two fords Washington managed to gather about one hundred of the soldiers. The general hoped to make a stand here, until Colonel Dunbar should come up. He could not yet credit that all was lost. It was impossible that British Regulars should be beaten by a mob of Indians and a few French. So Captain Washington was sent upon the back trail to summon Colonel Dunbar. He rode the forty miles through the forest partly by night. He had been gone scarcely an hour when nearly all the one hundred men deserted the camp. They had heard the whoops of the terrible Indians on the other side of the river. Only the faithful officers and a handful of the Virginians remained. General Braddock consented to fall back again. He was determined to mount a horse, but he could not sit in the saddle. They made a litter of his broad crimson sash slung between two poles (the litter of a British officer) and carried him onward in that fashion. The same was done for Aides-de-camp Orme and Morris. Sashes were worn by the officers for that purpose. The time was six o'clock. The battle had lasted from two until five. Now the shadows of evening were trooping from the hollows and the forest depths. The French and the Indians did not cross the river; they were busy collecting the spoils—they expected a return and an attack. They could hardly believe in the victory. Neither could General Braddock. His mind was filled with plans of advancing with the Dunbar force and winning the battle. He did not know that he was mortally wounded, but the surgeon had told the others. "All is lost! Braddock is killed! We have seen wounded officers borne off the field in bloody sheets. The troops are cut to pieces!" That had settled matters. The Dunbar wagonners and non-combatants joined the Braddock wagonners. The soldiers refused to go forward. With wagons for the wounded, and with supplies, guarded by one company, Washington started back. He reached the General Braddock camp this same night, July 11, and reported that the Dunbar column was without discipline and could not be relied upon. "We shall see," said the general. "I shall rally them and we will take Fort Duquesne." The Dunbar camp was thirteen miles. The little party hastened at best speed. But Captain Washington's words had been true. The general, now very weak, could do nothing with the soldiers. Colonel Dunbar would not help; he had decided to retreat to Philadelphia, where he would be safe from the Indians. General Braddock gave up. The camp was moved one day's march, to the same Great Meadows where Washington himself had been obliged to yield, with honors. The general said little more, except that he murmured, again and again: "Who would have thought it?" and toward the last he uttered, hopefully: "We shall better know how to deal with them another time." He died here at Great Meadows, within one mile of Fort Necessity, in the night of July 13. They buried him before daybreak of July 14, his sword upon his breast. They dug a grave in the road; Washington read the burial service by torch light; no volley was fired; when the grave had been filled in the teams and wagons were driven over it to destroy all sign; the troops followed. Here General Braddock was left for almost seventy years. In 1823 a gang of laborers, working on the road—by this time a well-traveled road through a settled farming country of the thriving United States of America—unearthed some bones, and rusted steel, and fragments of British scarlet and gold. They had found the lonely grave of Major-General Sir Edward Braddock, who on July 9, 1755, in obstinately launching his massed British grenadiers against the French and Indians of old Fort Duquesne had lost, in killed and wounded, sixty-two officers out of eighty-six, and more than seven hundred rank and file. There still were people who said that if he had listened to the advice of his aide, George Washington, he would not have failed. As for Fort Duquesne, that had yielded long before the Revolution, also. On November 25, 1758, young General George Washington had marched in, leading an advance column of his Virginians. The French had fled. He renamed it Fort Pitt, in honor of England's great prime minister, Lord Pitt. He had visited it again, twelve years later, and had seen the settlement of Pittsburgh. And by 1823 the City of Pittsburg had swallowed old Fort Pitt and was creeping toward Braddock's Field. This story of Braddock’s Bloody Field is featured in the book entitled the Indian History for Young Folks by Edwin L. Sabin and was published by George W. Jacobs and Company in Philadelphia in 1920.